This Monitor Stand is 10 Feet Tall! 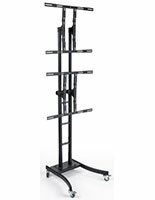 Buy this Discount Monitor Stand for 37'" Flat Panel TVs Online Today! 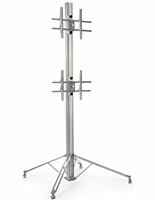 Cheap Montior Stand with Bracket for LED TV Manufacturer! 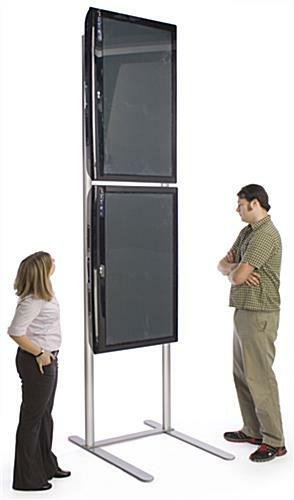 10-foot high stand makes a television display visible from across a room. 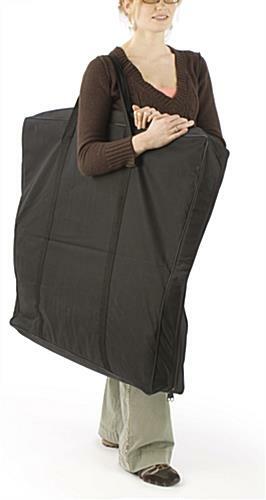 Carrying bag & multi-section design makes your extra tall TV stand portable. Tethered Allen wrenches eliminate the potential for losing tools. 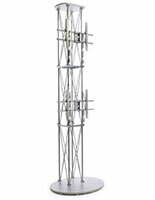 Universal brackets display televisions either vertically or horizontally. discount monitor stand for 37" flat panel TVs and more is sold with (2) VESA television mounting brackets (compatible with 200mm x 200mm to 600mm x 400mm) to support flat screen plasma or LCD televisions up to 60" that weigh less than 80 pounds. These television mounting brackets were engineered to fit most standard television models and sizes including LCD, plasma, and LED televisions by Samsung, Toshiba, and Panasonic. This flat screen monitor bracket, monitor stand, is composed of durable aluminum with a strong steel base for added stability. 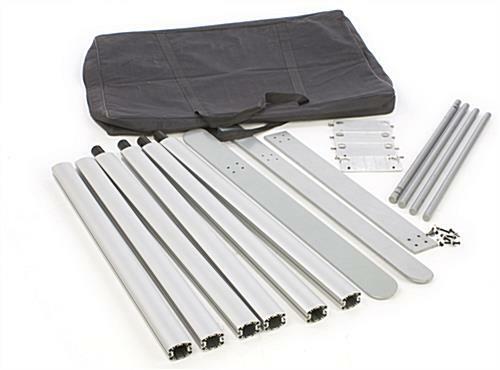 This monitor stand is height-adjustable – just slide the brackets up or down the side channels. 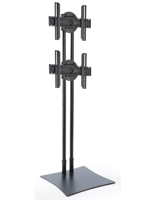 Once in position, use the Allen wrenches that are provided with each monitor stand to tighten the set screws. These Allen wrenches attach to the extra monitor stand so they are not lost when transporting the unit to and from locations. This monitor stand, also known as a flat screen television stand, is an excellent marketing tool that greatly increases your digital advertising capabilities! s monitor stand is raised high above the rest! 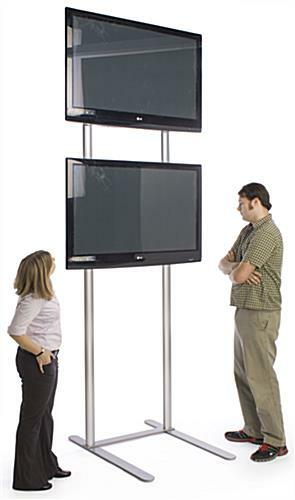 The plasma television stands, monitor stands are designed to hold (2) flat screen plasma or LCD television monitors in either portrait or landscape orientation. This monitor stand is an excellent exhibit at trade shows, in retail settings, and at training seminars. 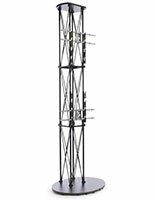 The modular design is simple to set up and makes the unit highly portable. The monitor stand, also known as a plasma television stand or extra tall entertainment center, is even equipped with a handy carry case so you can keep all parts together as you travel from place to place! 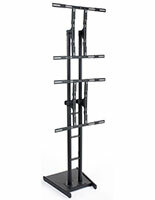 Buy this discount monitor stand for 37'" flat panel TVs online today! 32.5" x 120.0" x 44.0"
44.0" x 33.0" x 4.0"